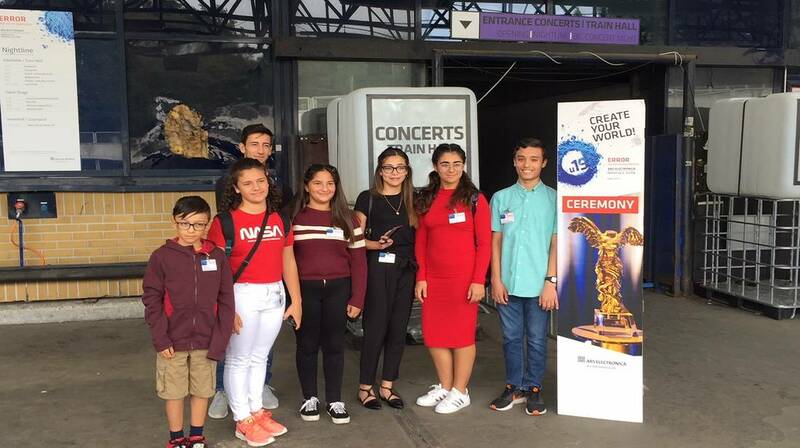 The seven young Maltese winners of Valletta 2018’s Under 19 ‘Create Your World’ Competition, travelled to Linz, Austria during the first week of September, to attend the prestigious Ars Electronica Festival. During their 4-day trip, the youths had the chance to visit the Ars Electronica Festival as well as explore parts of the city, meet other winners from Austria, interact with the projects on display, and speak about their own creations. The ‘Grand Prize’ and the two ‘Distinction’ prize winners’ projects were exhibited at the Ars Electronica Festival as part of the special section dedicated to youths. During the Award Ceremony on the 7th September, an impressive montage of Austrian Under 19 projects and winners were celebrated including the young group from Malta who were presented as the first winners of the Maltese edition of this prestigious competition. Nicholas Conrad won the Grand Prize of €2000 with his creation, ‘Musical Weather Station’, while Zack Ciappara’s ‘Freehour’ App, and Mia Gauci and Amy Portelli’s ‘Astrobot’ won them both a Distinction prize. Mia Gauci and Amy Portelli were also awarded the special Esplora Under 14 prize for their work. Charlotte Formosa and Cara Borg Aquilina both won the Merit prize with their respective projects ‘Music in the Capital’ and ‘Toolbox for Peace’. The youngest winner was Thiago Jo Said, who won the ‘Esplora Under 10’ Award with his creation, ‘Fighting in the Arena’. A special exhibition will be set up at the Esplora Interactive Science Centre in November 2018, where the winners’ work will be showcased. This exhibition will mark an important achievement resulting from the two-year collaboration between Valletta 2018 and Ars Electronica which was strengthened by the latter’s contribution to the activities carried out in collaboration with Esplora Interactive Science Centre during the Maltese Presidency of the European Commission in 2017. Back in March 2018, an open call for the submission of projects was issued by Valletta 2018. All young people aged 19 and under were invited to participate in this creative competition, where they had the chance to showcase their work and their creativity with the theme of ‘Create Your World’. Participants could submit work of any shape, including digital art, mechanics, technology, music, social projects, and even innovative futuristic ideas about the world we live in. Bringing the Under 19 Competition in Malta for Valletta 2018 as part of the European Capital of Culture Programme was possible thanks to collaboration with Prix Ars Electronica and the Ars Electronica Festival in Linz, Austria, as well as with the Esplora Interactive Science Centre.